Embossed Designs Printed on Silver Metallic Adhesive Foil. - Car Wash Safe! Some designs have 2 or three decals, please see individual product photos. Package Size: Aprox 6 x 8 Inches. Our Embossed decals will stick to any hard surface indoors or outdoors. Car Wash Safe and will last for many, many years. 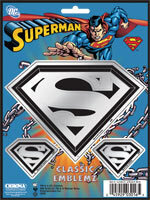 Click the button below to add the Embossed Superman Chrome Decals to your wish list.